What is "status" in the workplace, and how does it affect our interactions and experiences? Dave Collins, 1871 mentor and Founder/CEO of corporate skill-building consultancy Oak and Reeds, breaks down status and how we can use improv to raise the status of those around us. *Team-building exercise included! In January, Academy Award-winning actress Octavia Spencer spoke about the topic of equal pay during an interview at the Sundance Film Festival. She revealed that in contract negotiations for a current project, her co-star Jessica Chastain learned that Spencer was earning five times less than she was for appearing in the same movie. Upon learning that, Chastain went back to the producers and demanded that her co-star’s pay be increased, otherwise she’d walk away from the movie. She was successful - Spencer received a substantial pay bump and the project continued on schedule. Race and gender in the workplace are currently squarely in the center of our national consciousness. Practically every American industry has seen leaders at the highest levels removed from their jobs because they abused people, neglected responsibilities or acted cruelly to those who report to them. As I’ve read through the stories, tweets, interviews and discussions on this topic, I’ve realized there’s a theme from the world of improvisation that crosses over directly into this workplace conversation. It’s a concept that seems to underlie all the discussions and deserves to be discussed on its own. That concept? Status. In improvisation, status is the perceived difference in power between two characters. When played for laughs, it can be a terrific tool to show the absurdity of our expectations about two characters and our assumptions about how they will behave. The movie Trading Places is an excellent example of how playing with “status” can create hilarious results. If you haven’t seen the movie (You should! It’s on Netflix…), the premise is that a young Eddie Murphy is picked off the street by two old and crusty stockbrokers. They’ve made a bet over whether or not they can turn any random person into a successful financier. Throughout the movie, Murphy’s character slowly but surely raises his perceived status through miscommunication, embarrassment and outrageous bravado. Why do I bring this up? The key tool he uses throughout is “Status Transfer.” He’s able to use status expectations to his advantage to improve his stature, wealth and influence. At a more fundamental level, he learns how to do two things: raise his own status and lower the status of others. By the end, he’s become so adept at transferring status to himself that, well...I won’t spoil it! In January, a new law went into effect in Iceland. It is now illegal for companies which are larger than 25 employees to pay men more than women for doing the same job. To enforce this new law, companies must submit payroll records every three years to prove they pay employees on an equal level. Status is a behavior, not an endowed trait. In an organization, status is constantly shifting, evolving and changing. In one meeting, you may be the highest status person in the room, later that afternoon you may be the lowest status and have to sit quietly while others make decisions and you sit silently. Provide insights and context of what’s going on “at the top” so that your colleagues are armed with accurate information and facts. Provide mentorship or be a peer coach. Seek to mentor colleagues and be a resource who can provide help and assistance. Create opportunities. Give people the chance to do the work that proves their skills and raises their profile. Give them credit for a well-done task. Speak up when others demean or disrespect others. Make it clear that you won’t stand for a widening of the “status gap” between powerful people in your company and those that report to them. In these newsletters I’ll be introducing you to simple group exercises you can facilitate on your own. This month, we’re looking at how to explore the subtle ways we take and give “status” to those around us. The following exercise is something you can do at the beginning of your weekly team check-in meeting or as part of a larger conversation around power dynamics in the workplace. After you try this out, let me know how it goes! I’d love to hear how you and your team understand the role of status in your unique organization. Also, please visit the Oak and Reeds website for more information and examples of training exercises you can run and debrief with your team. By becoming an 1871 member, you'll have access to the 30+ workshops a month that will teach you everything from funding strategy to marketing and sales to team-building. Get started by visiting 1871.com/membership. 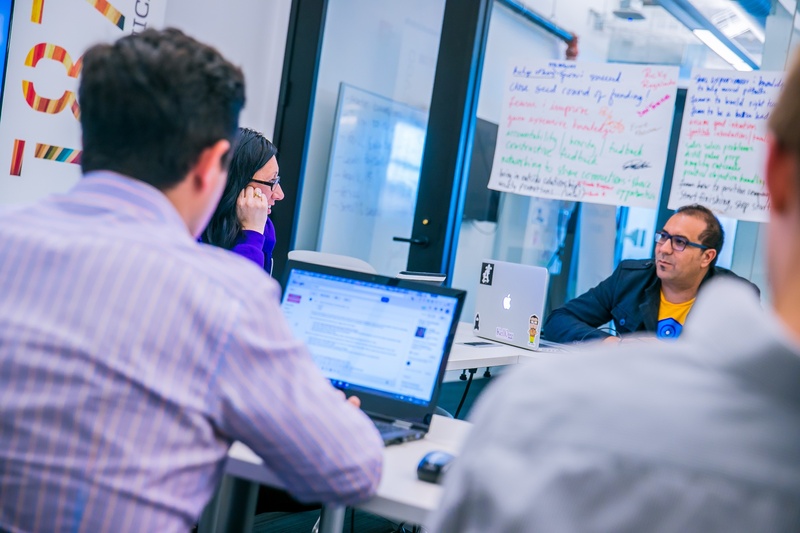 Interested in leading a workshop at 1871 or becoming a mentor? Apply at 1871.com/become-a-mentor.